Have you ever heard that saying:”Red skies at night, hunter’s delight. Red in the morning, hunter’s warning?” (Of course, I have adapted it some to fit my purpose). I witnessed one of the most stunning red sunrises this morning, but I should have known the beauty was only a prelude to a storm. Red Skies in the Morning, Hunter’s Warning! This morning, Sunny, Dusty and I hunted sage grouse in one of the most gorgeous settings in eastern Idaho (and that is all that I’m going to say about the location). My good friend Matt Lucia and I discovered this spot by what I have coined as a “Roadside Revelation,” which is unexpectedly locating a prime bird hunting area by sighting birds next to the road. In years past, I have found some of my favorite hunting places in just this fashion. Last year, Matt and I observed dozens of sage grouse right along the road as we traveled for an overnight trip to hunt forest grouse. Needless to say, we had a slight change of plans for the morning hunt, which coincidentally, happened to be Idaho’s sage grouse opener. Despite some good opportunities, I did not harvest a thunder chicken (as they are sometimes fondly called) that day. 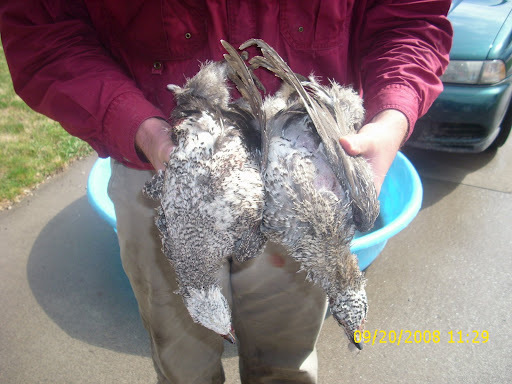 In fact, for numerous reasons, I have not bagged a sage grouse since 2002 . . . six long years. Today is exactly one year since that memorable hunt, except this time it was just me and my dogs. 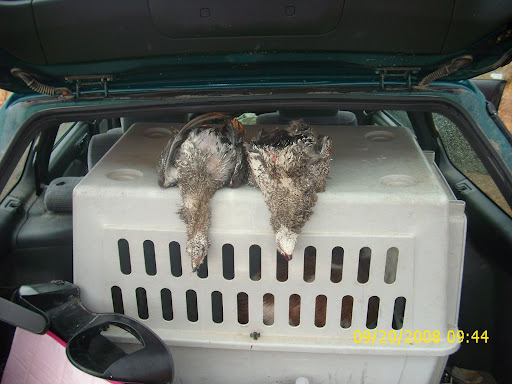 Also, this year the Idaho Fish & Game Department extended the season from one week to twenty-three days and increased the daily bag from one to two birds, so there was much to be excited about. Upon arrival, I grabbed for my Goretex jacket as it was tad bit chilly. As I put it on, the brilliant sunrise was like a heavenly vision, a good omen (or so I thought). 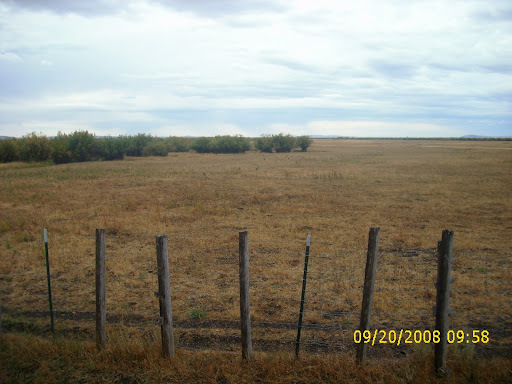 On our first hunt, we pushed up a sagebrush bench to the right. We did not find any sage grouse, but stumbled upon a herd of about ten cow elk just a stone’s throw away. At first, I thought they were going to run right over the top of me. In a word, “idyllic” (even in the rain). By the time I circled back to the car, I had warmed up enough to take off the jacket. Big mistake! Not ten minutes into the next hunt, the rain started to pour and before long, I was soaked to the bone. I forgot about the rain, however, when a big grouse flapped up just out of shooting range. Sunny and I scoured the area from where the first bird rose and, as I suspected, a straggler flushed in range left to right and I made good on the shot. It was a beautiful male bird of the year. With a grouse in the bag and the six-year monkey off my back, my spirits soared even in the pouring rain. 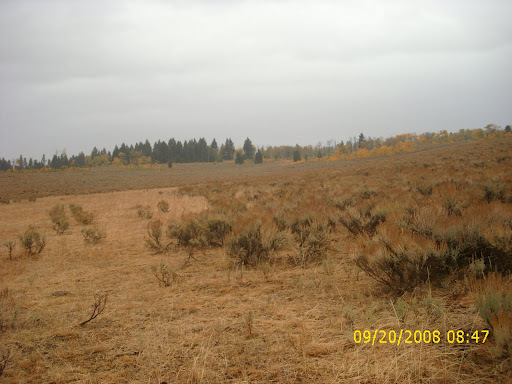 For our last hunt, I pointed the dogs toward a strip of sage brush about 50 yards wide and 150 yards long overlooking a small spring creek. To my delight, the strip was packed with birds and Bustin’ Dusty took note. For a minute there, I thought my Elhew Pointer was a Springer Spaniel as he flushed buckoo birds into the lowering horizon. In my zeal, I missed a few long shots. I lost track of Dusty during the chaos but soon located him to my right twisting on point with a sickle-like tail. I walked over to honor, but the quarry must have been running and Dusty recommenced hunting. Twenty yards ahead, a big flock of grouse evacuated. I missed the first one, but picked a closer bird and winged it on the second shot. As Sunny and I went to retrieve the fallen grouse, more bombers blew out of the end of the strip, but I could not shoot as I had a bird in the bag and one on the ground. At first, I did not see the downed bird, but Sunny, my French Brittany, soon nailed it with an intense point. As she went in for the retrieve, the bird flushed again, but this time I made a solid shot. This grouse was a big old bomber! As I walked back to the car with one of the most hefty game bags I can remember, I flinched from the cold rain pelting my face. As outdoorsmen, sometimes we have to take advantage of the precious few days allotted to us- no matter the weather. If I would have let a little rain get in the way, I would have missed out on one of my best hunts ever. 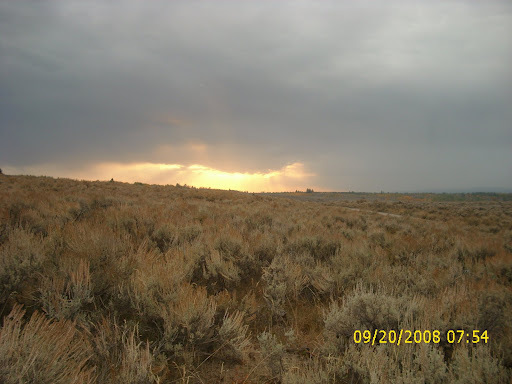 Before today, I had never harvested a limit of sage grouse or even seen as many birds for that matter. For me, this stormy hunt brings new meaning to the nick name, “Thunder Chickens.” Idaho truly is a State of Grouse, or should I say “State of Grace?” Either way, the Lord’s bounteous creations are available here and for that I am truly greatful. Man, I love this place! Roadside Revelation: Double click on this picture to see a field of sage grouse right off the road. 100 miles later and I’m still soaked! Wish i was there too! Great writing and pictures! 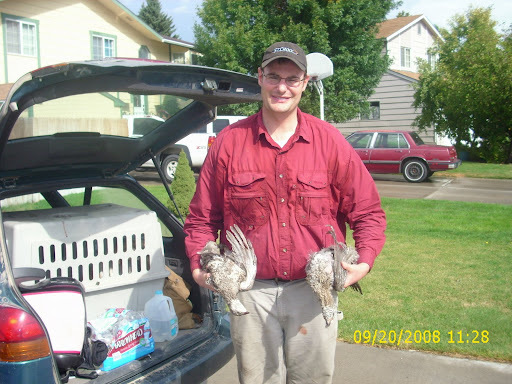 I can’t believe I found my cousins while surfing the web for my addiction, bird hunting. Lets go!